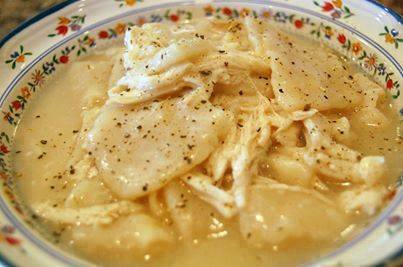 A bowl of chicken and dumplings. A glass of sweet tea. It’s a meal any Kentuckian would be proud to fix and danged happy to sit down to. And it’s not hard to make. Come on, I’ll show you how. Roll the dough out thin with a heavily floured rolling pin. Dip your cutter in flour and cut the dumplings in squares about 2?x2?. It’s okay for them not to be exact. Just eye ball it. Some will be bigger, some smaller, some shaped funny.